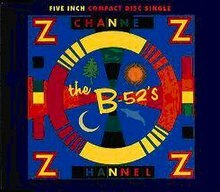 "Channel Z" is a single by The B-52's from their 1989 album Cosmic Thing. The song was the first single from Cosmic Thing, but did not achieve as much success as the follow-ups "Love Shack" and "Roam." The single was reissued with a new 12" Mix after these two singles and before "Deadbeat Club." The song was about a fictional radio station whose motto was "Channel Z: All Static, All Day, Forever!". The song peaked at number 61 on the UK Singles Chart. In the US, it topped the Billboard Modern Rock Tracks chart. The song's music video features The B-52's playing on stage in front of an audience, along with clips of them running through a forest. It was shot outside of New York City, according to the credits of The B-52's 1979–1989. "Girl from Ipanema Goes to Greenland"
"Tell It Like It T-I-Is"
This page was last edited on 7 February 2019, at 23:33 (UTC).